Even though it might appear to be pretend Internet money, by design, there are a finite number of Bitcoins available. In the same way that the limited amount of gold on the planet and the effort required to extract it from the ground keeps prices high, the scarcity of Bitcoin is intended to make sure it remains valuable. As of right now, over 80% of all the Bitcoins that will ever exist have already been put into circulation. That sounds like a lot, but it’s expected to take another 100+ years to free up the remaining ones, so we’ve still got a way to go. Even though his device will probably no longer exist when the final Bitcoin hits the pool, [Jonty] has built a ticker that will count down as the final coins get mined from the digital ground. The countdown function is of course a bit tongue-in-cheek, but the gadget also shows slightly more pertinent information such as the current Bitcoin value, so you can always remember what a huge mistake it was not to invest while they were still worth pennies. On the hardware side, this is a pretty simple project. The enclosure is laser cut 5 mm MDF, and it holds a Raspberry Pi 3, a MAX7219 32×8 LED dot matrix display, and a 10 mm white LED with accompanying resistor. 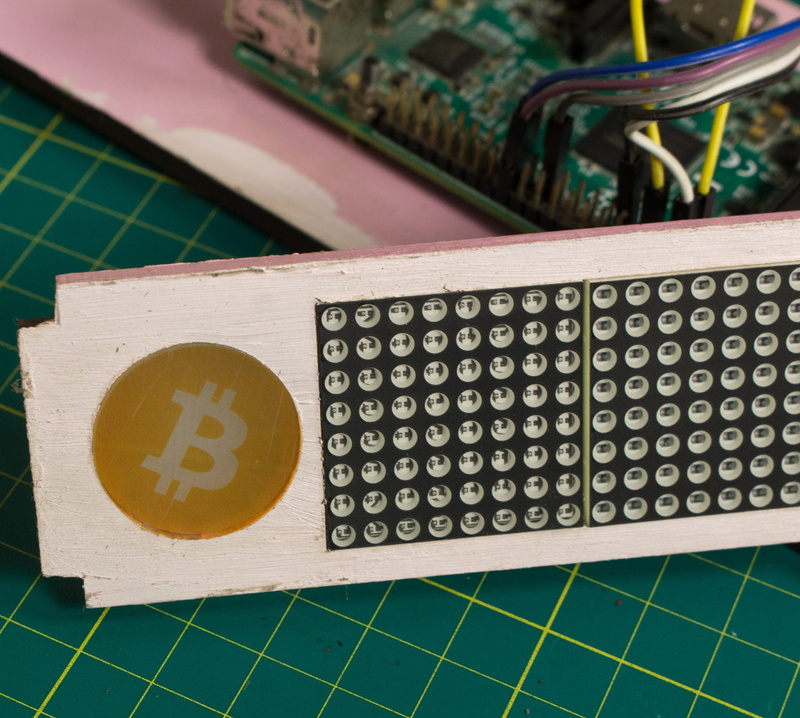 The white LED is placed behind an acrylic diffuser to give the Bitcoin logo on the side of the display a soft pleasing glow when the device is powered up. There are no buttons or other controls on the ticker, once the software has been configured it just gets plugged in and away it goes. As for the software, it takes the form of a Python script [Jonty] has created which uses Requests and Beautiful Soup to scrape the relevant data from bitcoinblockhalf.com. The script supports pulling any of the 19 variables listed on the site and displaying it on the LED matrix, which range from the truly nerdy stats like daily block generation to legitimately useful data points that anyone with some Bitcoin in their digital wallets might like to have ticking away on their desks. The first decade of Bitcoin has been a pretty wild ride, not only monetarily, but in the wide array of hardware now involved in cryptocurrency mining and trading. From Bitcoin traffic lights to custom-made mining rigs that are today more useful as space heaters, it takes a lot of hardware to support these virtual coins. Due to the nature of Bitcoins, blockchains, and ledgers, the entire history of Bitcoin has been recorded. Every coin spent and every satoshi scrupled has been recorded for all to see. It’s time for a retrospective, and not just because I wanted to see some art based on the covers of Now That’s What I Call Music albums. No, ten years is a lot of stories to tell. What Can The Blockchain Do For You? Imagine you’re a general, camped outside a fortified city with your army. Your army isn’t strong enough to take the city without help. But you do have help: camped on other hills outside this city are a half dozen more generals, with their armies ready to attack. Attacking one army at a time will fail; taking this city will require at least three or four armies, and an uncoordinated attack will leave thousands dead outside the city gates. How do you coordinate an attack with the other generals? Now, how do you coordinate your attack if one of those other generals is Benedict Arnold? What happens when one of the generals is working with the enemy? This situation is a slight rephrasing of the Byzantine Generals Problem, first presented in the ACM Transactions on Programming Languages and Systems in 1982. It’s related to the Two Generals Problem formulated a decade prior. These are the analogies we use when we talk about trust over a communications channel, how hard it is to transmit knowledge, and how to form a consensus around imperfect facts. This problem was upended in late 2008 when Satoshi Nakamoto, a person or group of people, published a white paper on the ‘block chain’. This was the solution to double-spending in digital currency. Think of it as having a digital thing that only one person could own. As a test of this block chain technology, Bitcoin was launched at the beginning of 2009. Things got more annoying from there. Now, blockchain is at the top of the hype cycle. Every industry is looking at blockchain tech to figure out how it will work for them. Kodak launched their own blockchain, there are proposals to use the blockchain in drones and 3D printers. Medical records could be stored on the blockchain, HIPAA be damned, and there’s a blockchain phone, for reasons. This doesn’t even cover the massive amount of speculation in Bitcoin itself; thousands of other cryptocurrencies have also sprung up, and people are losing money. The blockchain is a confusing thing, with hashes and Merkle trees and timestamps. Everyone is left asking themselves, what does the blockchain actually do? Is there an independent body out there that will tell me what the blockchain is good for, and when I should use it? You’re in luck: NIST, the National Institute of Standards and Technology released their report on blockchain technology (PDF). Is blockchain magic? No, no it is not, and it probably shouldn’t be used for anything other than a currency.